For a city with so many great place to eat, there are relatively few food tours out there. For those unfamiliar with the concept, it is essentially a guided tour of various restaurants and establishments where little bites are served. Think of it as a moving multi-course meal. 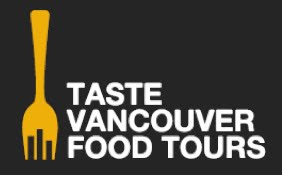 I was invited by Taste Vancouver Food Tours to check out their Gastown Food Tour hosted by Gassy Jack himself. Well... not really Gassy Jack, but someone doing a good comedic impression of the historic neighbourhood which is named after him. We met up at the Starbucks in Canada Place where we were supplied with lanyards and a headset (which was tuned to the same frequency as Gassy Jack's mic). As I was mingling with the other people participating in the tour, we were presented with 2 sample sized items consisting of a Mocha Cookie Crumble Frappuccino and Banana Loaf. If you've ever had a frap at Starbucks before, this brand new one is pretty much the same except for the addition of crumbled cookie. The best way to "drink" this is with a spoon. As for the banana loaf, it was pretty moist and had a nice spice to it (spice in terms of spices, not spicy). Personally, I would like to see a local place featured in this spot. 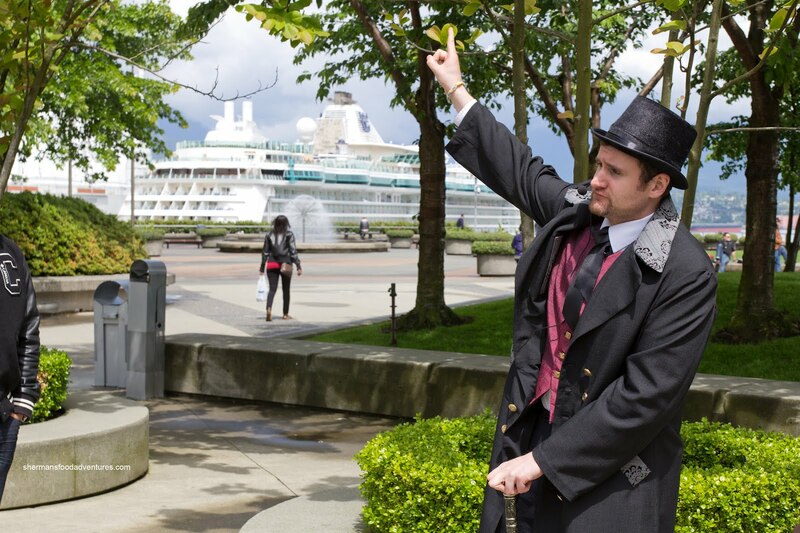 After this, we started our Gastown Tour with a stop at Rogue Kitchen & Wet Bar for some Lobster Mac n' Cheese. For a food tour with so many stops, this was a fairly healthy portion of al dente noodles, nicely prepared lobster chunks within a mildly cheesy sauce. This was a drier version of mac n' cheese, but it was still moist. It wasn't overly cheesy nor creamy, but the flavours came through. I loved how they didn't put a bunch of truffle oil in it (which usually totally overwhelms the dish). 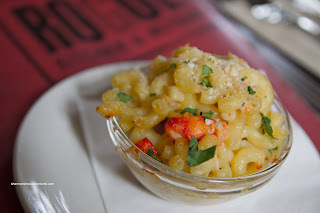 On a side note, I actually returned to Rogue that same night with my hockey team because the lobster mac n' cheese was impressive enough. Furthermore, as you will see later in this post, portion size matters too. It is not that there wasn't enough food in the tour, but to get a sense of an item, it has to be large enough than a small little nibble. 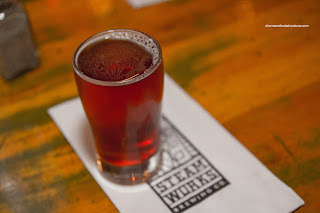 After Rogue, we sauntered across the parking lot over to Steamworks for some brew. We sampled the Copper Roof Ale which had a bite while still going down smooth. We also tried the Raspberry Ale which I wasn't a huge fan of. It started off nice with a fruity kick, but then went down like cough syrup. As a personal preference, I'm not a huge fan of beverage-only stops especially alcoholic ones. A few bites of food (like some appies) would really help enhance the experience. 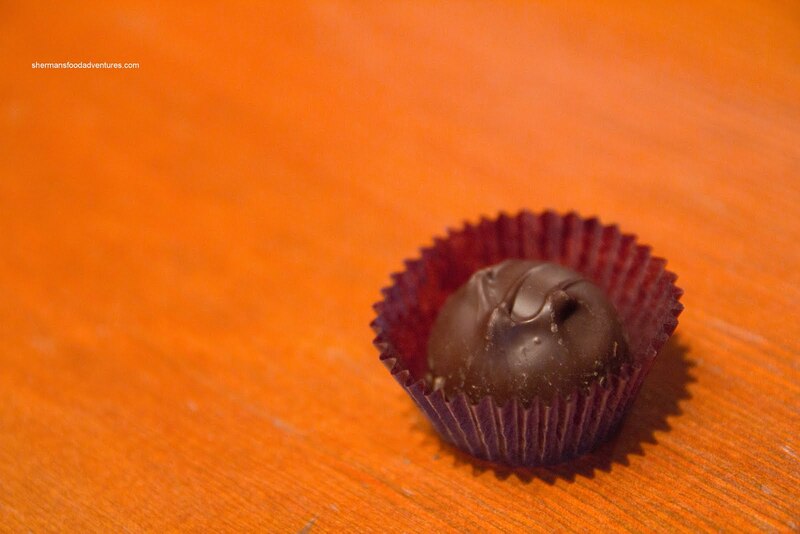 From raspberry ale, we went to Roger's Chocolates and tried their Raspberry Dark Chocolate Truffle. This was not bad since it wasn't too sweet and I could get the bitterness of the dark chocolate. I only wish I could eat more chocolate! 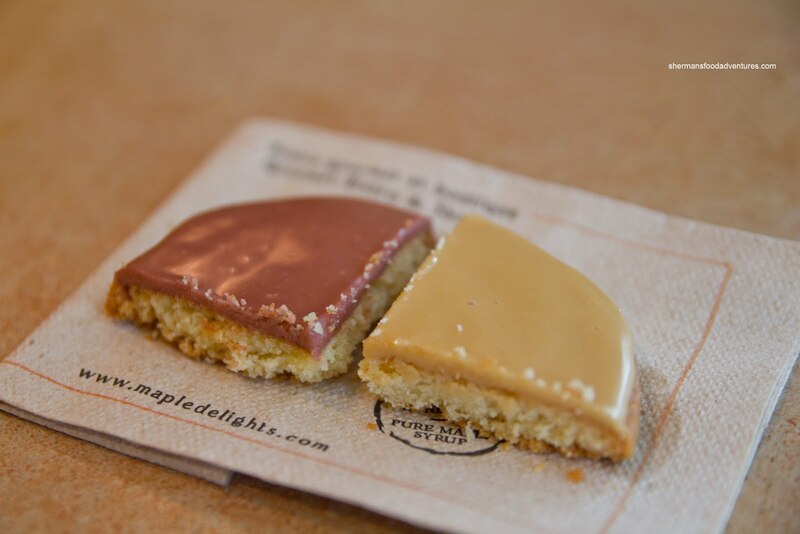 Not to fear, more sweets were near in the form of Maple Delights Bistro. There, we were given a sample each of their Raspberry and Maple Shortbread Cookies. Well, I must confess that I find anything maple to be extremely sweet. And these cookies were no exception. On top of the buttery and crumbly shortbread was a super sweet maple glaze. Thank goodness for the tea that was served along side of it. That helped control the sugar-overload. We also got to sample their maple cotton candy (yes, more sugar) and it was predictably sweet. Moving along, we headed across the street to Brioche. We ended up on the backside of the restaurant on Water Street. The main entrance is on Cordova. At the back are a few seats that compliment the small dining room. 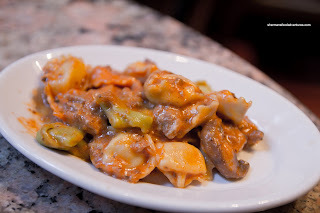 Here we were served a decent portion of their 3 Cheese Tortellini with sausage tomato sauce. We were given a basket of bread as a side to the pasta. The tortellini itself was a bit soft with a tasty cheese filling. The sauce was rich, meaty and creamy with peppery notes and a mild tang. This was an enjoyable pasta. After that, we went back across Water to Trees Organic to sample their famous cheesecakes. Now, I'll be frank here. The portion size of the cheesecake was far too small to make any impact. There was 2 to choose from, one being the chocolate cheesecake and the one that I tried, the Pineapple Cheesecake. 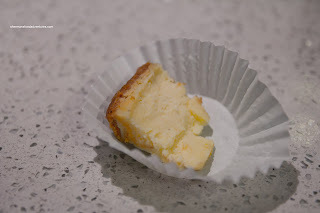 Although the portion was tiny, I was still able to get the rich, smooth and velvety baked cream cheese in the cake. The pineapple was not very apparent, possibly due to the sample size. I liked how it wasn't very sweet. From Trees Organic, we took a stroll down to the famous steam clock and crossed the street again to the Water Street Cafe. We were ushered into a private upstairs dining area to sample another small bite. 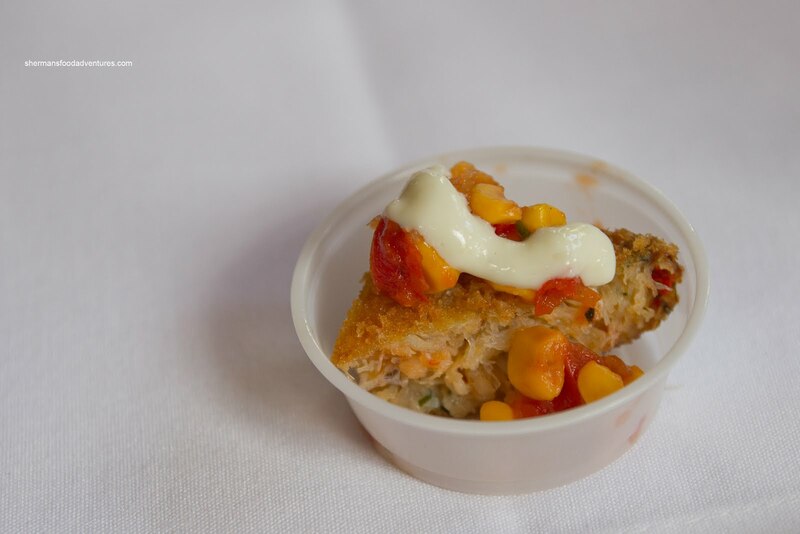 It was a quarter of their West Coast Crab Cake consisting of dungeness and blue crab, pacific shrimp, corn salsa and garlic aioli. Okay, I'm sure it had something to do with the portion size, because I didn't get much fluffy crabness nor much in the way of natural crab sweetness. The corn salsa, on the other hand, was quite apparent with the crunch and sweetness of the corn. Again, I'm not looking for a humongous crab cake, just something bigger than the one we had. From there, we inexplicably visited John Fluevog. Yes, it is wesome that there is a 10% off coupon included in our package, but there was not much to do (nor eat) there. Even for the people who are interested in shoes, the time allotted is not enough to actually shop. We could've done without this stop. Moving close to the end of the tour, we paid a visit to Peckinpah, which is a Carolina-style BBQ. Generally, their meats are more dry and the sauce is thinner. 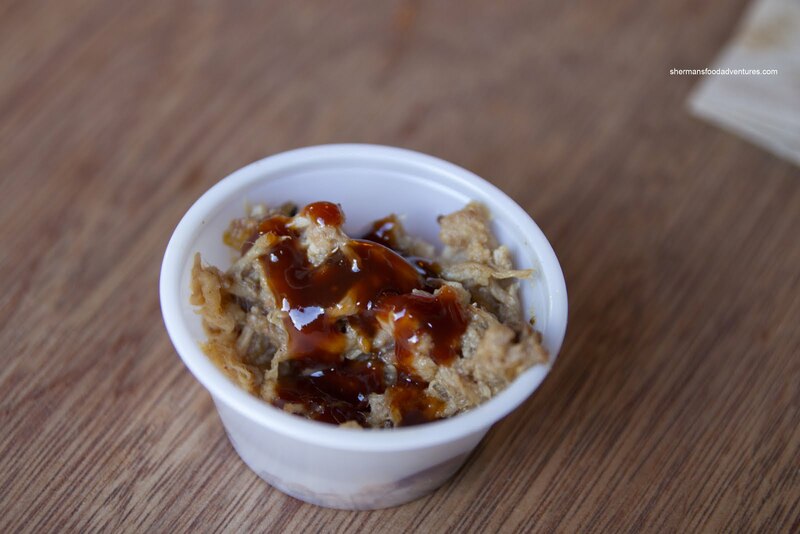 We were given, once again, a very small sample of their Pulled Pork. I lightly doused it with some BBQ sauce. It was moist and tasty, but then again, it was too small to make an impact. Onto our last stop, Gastown Tea Company, we were served Fruit Symphony Tea with an oatmeal cookie. I really liked the tea, it was aromatic and of course fruity. 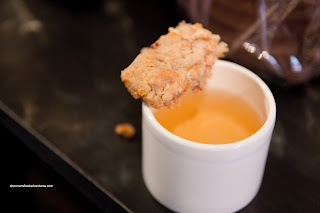 The little bite of chewy cookie was a nice sweet accent to the tea. Now, despite my criticism, the tour itself is a fabulous deal for only $39.00. 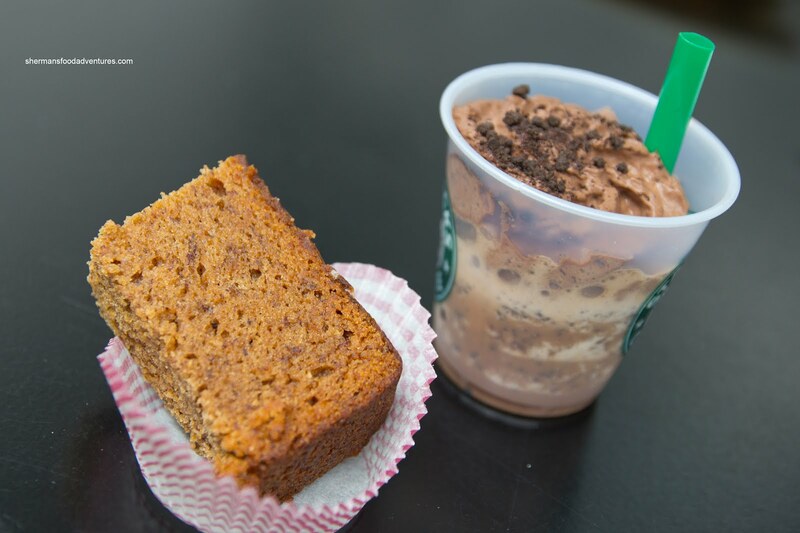 Now, the reason why some of the portion are really small is because the restaurants are providing the food for promotional purposes. Hence, we can't expect to much. Furthermore, with 10 food and beverage stops, it might be too overwhelming for some people. But in my opinion, for someone to return, it would be best that the sample size be impactful. The tour operators don't have a lot of control over that though. Yet again, if we look at all the stops and the entertainment value provided by our host, you can't really lose for the price. Out of all the places, you are "revisiting", such as Brioche and Peckinpah, based on the samples you tasted, would it return for a full meal (sort of a revisit)? @KimHo I think that the Brioche sample was both good and well-portioned. I may have to revisit them as I wasn't exactly impressed with my initial one. With Peckinpah, I was neither impressed the first time nor this time either. Not returning. The sample was laughable.